British crime fiction author P D James has died, aged 94, in her Oxford home. If you love reading crime fiction then you would’ve known P D James. 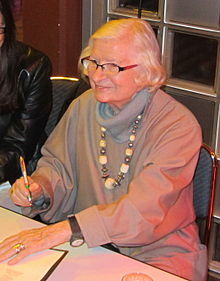 She was the author who created the famous detective and a poet Adam Dalgliesh in her series crime fiction titles, which made into file and TV series as well. James didn’t start her writing career until she was well up to her 40s due to the hardship of her family life. She was forced to work when she was 15. James worked in the crime justice system and the health services and it provided her rich and solid background information for Dalgliesh series. James developed stories by laying thick layers of social context and readers have to peel through dark side of human beings and society, to understand her stories better. Often she wouldn’t hesitate to put Dalgliesh into danger. James liked to stick to classic plots, like Christie. But that didn’t stop James writeing moving characters, some with subtle or gentle manners; other, individuals, or organizations, cruel as the devil. Death Comes to Pemberley was her last crime novel and a contribution to Jane Austen, published in 2011 when she was 91. Her age didn’t affect her sharpness. It was adapted into a TV show. Parramatta City Library holds some P D James’ titles. You can reserve them through our catalogue. While we farewell a crime queen, we can still enjoy her legacy. This entry was posted in Books to Screen, Fiction, Mystery & Crime and tagged Adam Dalgliesh mystery, Author, P D James, Parramatta City Library, reading, Writer by admin. Bookmark the permalink.